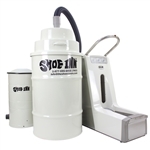 Our Shoe Inn Stay automatic shoe bootie dispenser is the ideal machine if you need a dispenser for medium- to high-volume usage. This shoe cover dispenser machine is automatic and non-electric, so it can be easily deployed at any location suitable to your needs. 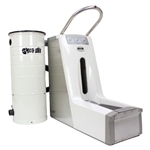 This stainless steel and ABS plastic cleanroom bootie dispenser machine, which holds up to 220 disposable shoe covers in two bundles, is easily loaded in bulk. This makes it easy to maintain in higher-volume applications. The built-in stainless steel handlebar, which you can also get in stunning metallic blue or metallic red as shown, provides extra stability. This automatic shoe cover dispenser is ideal for use in a variety of environments such as manufacturing or food processing plants, laboratories, clean rooms, medical / healthcare facilities, movie sets, or anywhere you need a shoe bootie dispenser. Using a Stay automatic shoe cover dispenser will bring you ease of use, time savings and added safety! The Shoe Inn Stay comes with an adjustable loading feature to make it easy to load any of these eight types of disposable shoe covers. To receive a no-obligation quote on shoe covers and our auto shoe cover dispensers for free, including volume pricing, please fill out this form. Let us know if you see this dispenser anywhere else online, and we will match or beat their price! The Shoe Inn dispenser is a wonderful addition to our lab! Our techs love the ease of use and hands-free design. This reduces the risk of contaminating one's hands when applying shoe covers, and provides the safety of a handrail. The shoe covers themselves stand up well to use throughout the day. Thank you for bringing such a great item to the market! All the folks here at Adnexus would like to thank Jeff Foster and Shoe Inn for such a great experience in obtaining our first Shoe Inn Stay model. We are currently in the process of remodeling our clean room and stream-lining the use of the small space and the Stay dispenser has a small enough footprint to do the trick. Not only does it fit well inside a small space- it looks great and allows all clean room users to gown-in quicker and safer. I would absolutely recommend this product to anyone who uses shoe covers, what a great and novel idea! Thanks again Jeff, we look forward to supporting you with our patronage. I have been using this product now for over a year and the quality is excellent and it saves us considerably on the janitorial expenses. The machine is very user friendly for both loading and applying the shoe covers. I would recommend this product to anyone interested in saving money on both cleaning supplies and shoe cover products.